The Former Majority Association for Equality is a non-profit organization reportedly established to help underprivileged white males go to college although their site doesn't make that claim explicitly. Our goal: To financially assist young Americans seeking higher education who lack opportunities in similar organizations that are based upon race or gender. In a country that proclaims equality for all, we provide monetary aid to those that have found the scholarship application process difficult because they do not fit into certain categories or any ethnic group. 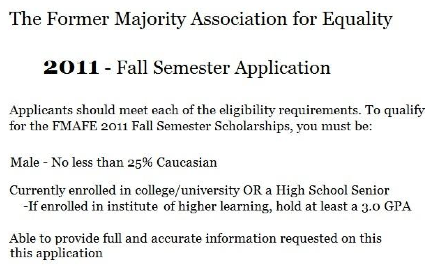 While this organization claims to be concerned about race, gender or ethnicity being used to provide financial assistance opportunities for college students, they have this on their scholarship application. No doubt, the irony of their use of race and gender exclusion is lost on them.